Our experienced team provides guidance on company drug policy formulation and we also offer drug awareness training. Why not book a demo today to find out how fingerprint drug testing could support your business? 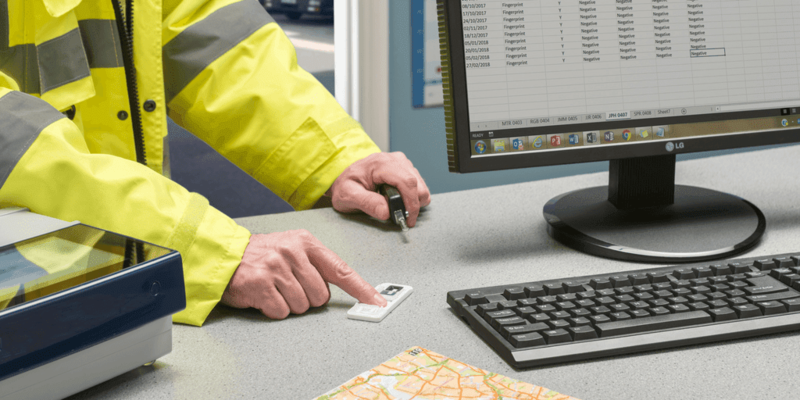 The ease-of-use and portability of the Intelligent Fingerprinting Drug Screening System mean it is particularly flexible and a useful option for employers looking to implement truly random and spontaneous workplace testing. With the System providing a negative or positive result for each drug in the test in just 10 minutes, testers are immediately alerted to a potential employee issue and can act according to their organisation’s drug misuse policy. Intelligent Fingerprinting has developed the world’s first portable, fingerprint-based drug testing system, which provides a quick and easy, non-invasive and dignified alternative to traditional point-of-care drug testing. Our fingerprint drug test works by detecting target drugs and drug metabolites contained within the tiny traces of sweat in fingerprints. Drug metabolites are substances produced by the body when it processes (metabolises) drugs. It takes less than a minute to collect the fingerprint sweat sample onto a small, tamper-evident cartridge. 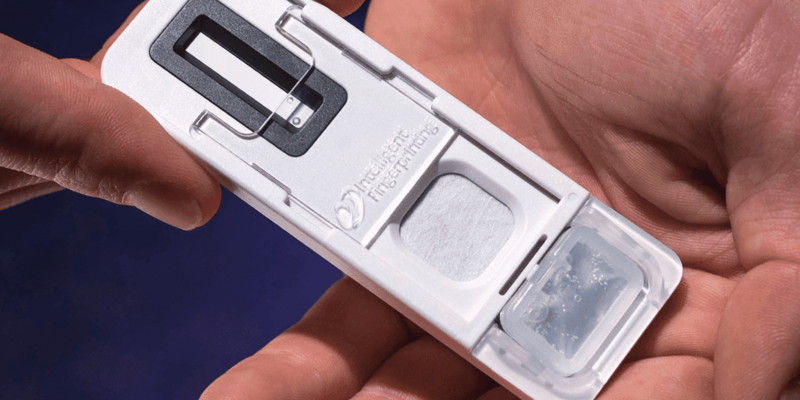 The cartridge is then analysed by the portable Reader 1000 to provide a screening result for each drug group in the test in minutes. The portable Reader 1000 – which is used to read the Drug Screening Cartridge – is operated via a touchscreen and features simple visual prompts. On-screen results are available in minutes and can be printed via the label printer accessory. Customer training is available on request. The accuracy of Intelligent Fingerprinting drug screening tests is comparable to other point-of-care drug screening tests such as those using urine and oral fluid samples. Our UKAS-accredited drug screening cartridges provide an initial screening result. This means that when our screening system indicates a positive result, this is known as a ‘presumptive positive’. For an unequivocal test result, further fingerprint samples are collected for a fingerprint-based laboratory test, ‘Confirmatory Analysis’, to confirm the test results. Do you offer a confirmation service? Yes, via our accredited partner laboratories using our Fingerprint Collection Kit For Laboratory Analysis. Please contact us for more details.